I never realized how many pieces of heriloom silver I have until I started this party. I thought most of my silver posts would draw from my monsterous flea market stash but I really haven't even delved into my found silver .....as I search for post topics each week I keep discovering family items...and there's so much more. This week I found one of my most prized possessions...my Great Grandmother's Sterling Silver Chatelaine..her private tool belt, if you will, however no lady would ever refer to anything she wears as a mere tool belt. Being a lady of society her tools were quite different than what was traditionally found on late 19th century women's chatelaine..she had ready at her side, a pill box, a pocket watch, enamel inlaid silver toothpick holder(as I understand pansies were her favorite flower), a sterling seal,reading glasses and of course a whistle ...not really sure I know what that was for. I believe there was also a hanging vinaigrette (you know, should one suddenly succumb to the vapors) not sure what hung on the last fob. 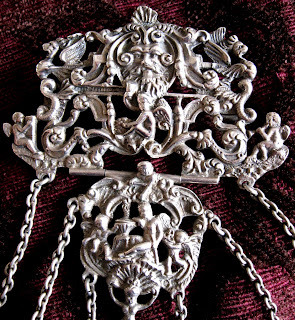 Chatelaine is a decorative belt hook or clasp worn at the waist with a series of chains suspended from it. Each chain is mounted with a useful household appendage such as scissors, thimble, watch, key, vinaigrette, household seal, etc.Chatelaines were worn by many housekeepers in the 19th century. They were also worn by Anglo Saxon women, as seen from the burial record.The name chatelaine derives from the same term used to mean the female owner, or husband of the owner, of a large house. The chatelaine was designed to have all the tools necessary for the woman of the household to sort out any problem she may encounter in her day, like a fraying curtain. I am so enamored with this gorgeous piece....there are 7 cherubs and dragons or gargoyles (I love gargoyles) on either side and the old North Wind man beautifully crafted in to this piece...it's really a treasure...hmmm makes me wonder what I would hang from mine...a cell phone, memory stick, lip gloss, shoprite card, so not glamorous...what would you hang from yours? The count down to the final Silver Sunday is upon us! So here's a few thoughts to think about for the next week. I will be posting the giveaway on the final Sunday...to earn chances here's the scoop. 1.You will receive 1 chance for every week you participated. 2. Adding to that, 2 more chances if you've become a follower. 3....and wait there's more...you will receive 1 more chance for every comment you've left throughout the party until it's final day on Feb. 7th. ....boy I'm long winded this week, one more final announcement....there will be a season 2 of Silver Sunday! This party is just way tooo much fun to stop! So I will be doing The Second Silver Sunday a monthly party on the second Sunday of every month......thanks for coming see you next week! This piece is amazing ... and I learned a lot from your post, thanks for all of the background info! ... and your photos are excellent, love the wine colored backdrop, so rich and elegant ... just like the chatelaine and the Great Grandmother! ... terrific post, Beth!! ps. Happy to see SS is sticking around! OMG!!! I am so excited!! I just put on my silver Sunday blog post that I was going to petition you to keep the silver Sundays going and then I come here to sign up and see that YOU ARE! Yeah! And once a month is just perfect!! 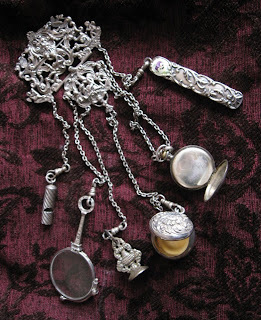 Ohhh my...your Great-grandmother's silver Chatelaine is just gorgeous!!! I must admit that I have never heard of...or seen...a Chatelaine! So this was such a sweet treat for me! I feel like I learn something new everyday in Blogland!!! Hehe! Well...I'm thinking how useful a Chatelaine would be! To think that as the grand lady of the house...she could have a toolkit (so to speak) right at her finger tips or waistline...is simply awesome!!! Now granted, I haven't seen any other Chatelaines but I suspect that your grandmother's is one of the more exquisite ones! It's gorgeous...I love all the beautiful ornate detailing...ahhh, those little cherubs...stole my heart!!! And...I just love all of the little tools that she carried!!! Seeing this exquisite piece sure takes me back to a day where such finery and notions seemed were a part of daily life! Ahhh...to have lived during such a time! I think we've lost much in our modern day! Well my friend, thank you so much for sharing this precious family heirloom with us...what a treat!!! Also, thank you for hosting Silver Sunday...I sure have been having fun participating in your party!!! I'm soooo glad to hear that you will run it a second season! Hmmm...now you have my heart all a flutter...and wheels a turnin'...for more Silver Sunday posts!!! Hehe! Have a super Sunday, sweet lady! What a treasure you have! 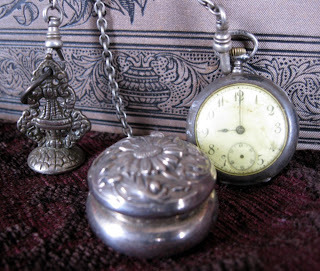 Your great-grandmother's chatelaine is just beautiful. 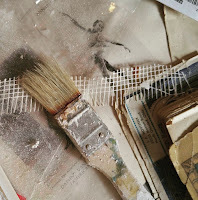 I also enjoyed getting out some old pieces that I normally haven't looked at for years - thank you! Oh, my Beth, this is a TREASURE! How beautiful and so was your great grandmother. WOW WOW WOW! Yippee. . . I'll have to start acquiring more silver to show off on Silver Sundays!! And ya know I am a follower, who wouldn't be, love your blog!! P.S. I meant to add also that the Swiss army knife is kind like the modern version (and nowhere as pretty) as a chatelaine! That is an amazing silver piece. I have never heard of a Chatelaine and I found it SO interesting. That is a wonderful treasure to have...just beautiful. I'm excited Silver Sunday will continue!! You are so fortunate to have such a lovely Chatelaine. I'm sure glad you told us what it was because there for a few minutes I was thinking I was pretty dumb and would be headin for Google! It's fascinating to learn about the ladies of the past and the unusual, lady-like gadgets transformed into works of art. I'm so glad that you are continuing with Silver Sundays. I have really enjoyed participating. Lovely piece (s)! Just beautiful and a great story to go with it. I'm so pleased you will be continuing the party, it's been a lovely one each and every week. To have a beautiful piece like this come through your family is very special! Thanks SO much for sharing your story! That is just beautiful and to think it came from your Great Grandmother makes it even more special. I love it and learned so much from this post also. I am glad you are going to host Silver Sunday once a month...I have enjoyed this a lot! This is an absolutely beautiful and very unique piece! Never heard of it, but I love it! And even more special that it was your great-grandmother's! I am so glad you are going to do this again! I keep finding more silver! But nothing like yours this week! Wow, wow, wow!!! I love that! I have a chatelaine, but it was for my scissors when I did needlework. So I kinda knew what they were. Man, that thing is gorgeous! That Chatelaine is stunning! What a fantastic treasure you have! I have only seen one before and it was my great grandmother's (it was originally her mother's). I remember thinking it was the coolest thing! It was not nearly as grand as the one you have. thank you so much for hosting this fun party and for continuing it! Yippee! That is just amazingly awesome! What a treasure!!! I'm so glad you've shown it to us. It was neat learning something new. I'm sure this is a very treasured item of yours. This is so amazing!! I've never seen anything like it. I'm glad I've caught the tail end of this Silver Sunday...I'll wait to share my treasures in the next go 'round! THAT is one of the coolest things I've seen in a long time!! I may succomb to the vapors just having such an item. Thank you so much for sharing it with us. And how delightful that you are continuing Silver Sunday for a second season. I too am finding that I have more silver than I realized. It'll be fun sharing our pictures. Gorgeous! It's amazing that you have that piece and the condition it's in. An amazing piece of family history. That Chatelaine is fascinating! I wouldn't have know what it was if you hadn't explained. The Old North Wind blowing on it, wow! What a family treasure. Thanks for hosting Silver Sunday and continuing it. How nice! Your great-grandmother was beautiful. My grandmother's maiden name was Jarvis also. Your chatelaine is a real treasure. If it were mine I would put it on a chain and wear it as a necklace. Thank you for hosting Silver Sundays. How wonderful you are keeping it going once a month. Time to clean out the closet and find more silver. Beth, what a gorgeous piece you've shared this week. I've never seen or heard of such a thing, but it's magnificent! What would I hang from mine? Scissors, screwdriver, lipstick, glasses . . . What an interesting piece and an interesting story to go along with it! Oh, I'm so excited you're going to host Silver Sundays every month . . . I have so much more to share and so much more to find out there to share! LOL! I'm off to finish off my post . . . have a terrific Silver Sunday! What an amazing piece!!! 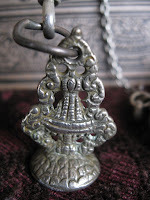 I had never heard of a chatelaine and loved your very informative post!!! You are so lucky to have this piece! You said it all - what a treasure! I have a book of vintage and antique ladies' accessories and there are truly some beautiful pieces. Yours is fabulous. How fabulous! I've never "seen" one in person, only in books. My modern day Chatelaine would have: a flash drive, a bottle of Advil, my cell phone, a Sonic gift card (for happy hours! 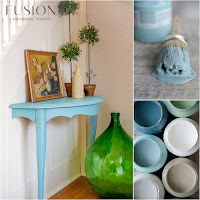 ), a small bottle of mod podge (you never know when you need to decopauge!) and a pocketsized guide to every thirft store in a 100 mile radius. Oh thank God its not ending yet. 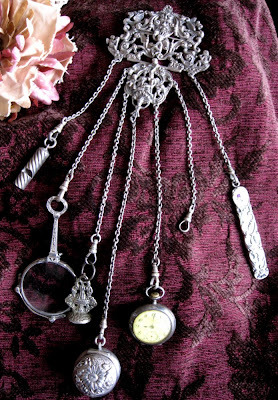 I was just starting to figure out this McLinky thing:) I so love anything Victorian, and your Great Grandmothers Chatelaine is just so special, unique, fabulous and in amazing condition. Are there enough adjectives here? Wonderful post. A Little bit of history. ~ Thank you Beth. Have a great week. I have never seen one of these except in the movies. How fabulous, and what a treasure that you received it! so beautiful! Oh my gosh, Beth, your grandmother's Chatelaine is simply spectacular! I loved reading about the history. 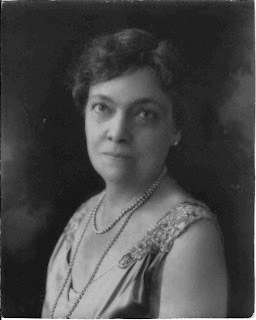 Can't you just see lovely ladies sitting about in a parlor, each with her own Chatelaine pinned to her waist? A lady certainly cannot be out and about without her personal vinaigrette! One never knows when the vapors may strike after all. What a beautiful treasure this is....and to think it was your Grandmother's....how very special! I apologize for what appears to be linking twice....the first one is linked to you instead of my post...silly me! Have a great night! What a beautiful piece, Beth! I've never seen one of these before. Looking forward to "season 2"! Beth, That, my friend, is one of the most amazing pieces I have ever seen! How wonderful that it is also a family heirloom. Thank you so much for sharing it! Beth, that is absolutely beautiful and you have a great treasure full of history, I love all those little trinkets. Hmmmmm...I am not sure what I would attach to mine...maybe some sunglasses, a calendar of my kids school and after school activities ANDDDDDD...a housekeeper??? hehehe. Thanks for sharing that lovely piece of beauty. Thanks for showing us and for hosting this fun vent. I've so enjoyed Silver Sunday and am glad that it will go on -- even if just monthly! Your chatelaine -- I've yearned for one but to have your grandmother's -- what a treasure, a true treasure. You're very lucky! Oh Beth, This is absolutely gorgeous and how wonderful that it is from your great grandmother! Everything was just so stylish back then. All the little tools are lovely and were so useful. Thank you very much for sharing this amazing piece with us and thank you for continuing Silver Sunday! That's great news! I am new to your blog and new to the party! What a gorgeous piece you have. Thanks for hosting the party :). 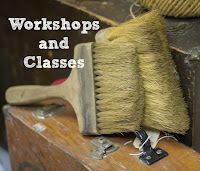 I just put my post up! Your chatelaine is a dream piece! I always love them, but I have seldom seen such a beautiful example. Thanks for sharing, it was a joy and thanks for hosting another Silver Sunday! I just found your blog... it's wonderful!!!! 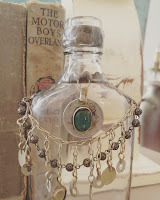 I love the silver saturday idea and the story of grandma's chatelaine was outstanding... I remember seeing one in Europe... 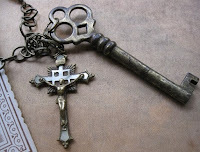 I think from the Middle Ages... it had lots of keys I remember... It was magnificent but I don't remember it being silver! Yours is just perfect... she must have been quite a lady! How wonderful for you to have such an heirloom. The story was so full of information about the past. Thank you. That Chatelaine is gorgeous!! I love all of your beautiful heirloom pieces. I have never heard of a Chatelaine before, and loved hearing about it. Stop by my site if you have a chance, I'm having a giveaway this week! Good Morning. At 2:00 I posted my entry for today but just now remembered to add the link with you. Oops. I have never heard of a Chatelaine, all that history and the stories, right up my alley. Love it. Thank you for being the hostess with the mostess. Thank you for continuing the party. So please enter me in....as a follower, as a weekly participant and comment giver. This has been fun. Thanks. This is such a fun link!! First, your chatalaine is fantastic. Such a wonderful antique to have. Second, I hope that the hammered aluminum that I have post counts toward the siver Sunday theme. 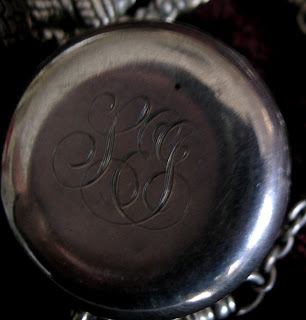 Beth... your Great Grandmother's Sterling Silver Chatelaine is amazing. What a wonderful piece.. and her photo... beautiful. A sweet and generous share today... I love it! (and an upcoming giveaway too!) You've given us so much fun just to participate! I'm so glad you're going to have a monthly Silver Sunday! I've got tons more to share! Your grandmother's chatelaine is so wonderful! I want to make one for myself - not that I'd actually wear it, although maybe I would! I spend a lot of time in my studio sewing, so I'd have a small pair of scissors, a thimble, a seam ripper (do they come in sterling silver? ), a magnifying glass (the eyes aren't what they used to be)... and I'm sure I'd think of more things. Once again you have some amazing silver pieces and the fact that they are are heirlooms makes it even better. Thanks for hosting this fun party. What a beautiful piece- I'm fascinated by chatelaines- it's rare for me to see one with as many "tools" as yours. I have a piece of a chatelaine- a weekly date book with celluloid pages. Now that's what I call a ladies Swiss Army knife. An absolutely lovely piece that belonged to a lovely lady. Beth, this has been so much fun. I couldn't let my computer fail me now!! I am a little late but I did it! I just love your collection of silver, especially this one. It must be such a treasure to hold and to look at and know that your Grandmother carried that with her! I wonder what we modern day girls would carry on ours!!!! You are probably right, a cell phone and some lipstick!!! Thank you again for hosting this fun event! I just found you thru Faded Charm and have become a follower. I'm pretty new to all this and unsure how to get the button but when i add my photos today i will definetly let all know where this Silver Sunday originated.Looks like fun. Your pieces are soooooo lovely and how fortunate you are to have them...I think all i got left to me was a ...SPITOON... LOL!! !I'M OFF TO LOAD PHOTOS YEAH! What a beautiful and interesting piece! I have never seen one before, but now that I have, I will have to be on the lookout for one! I just discovered you by clicking on links on other blogs. Quite happy to have discovered your blog, I may try to jump in the party if that is ok.
What an interesting post...beautiful heirloom piece. If I had one, it would definitely have a magnifying glass on one of the fobs! I have jumped aboard and started following you as well. I look forward to seeing what you post next! Beth, this is an amazing piece. To think that you have this in your family and that it belonged to your great grandmother. I'm in awe! I can't express how much I've enjoyed this meme. Thank you for hosting it and for the possibility of future ones. I like the idea of Second Sunday posts. I will definitely be a part of it. I regretted that I didn't get to participate today, but am away and couldn't get a post done for this one. I'll be there for the next Sunday though. Thanks again!!! That is a bueatiful pieace of art,and the cherubs on the top of it are so detailed. and what a treasure from your greatgrandmother. I also just did my first SILVERSUNDAY. so much fun to display your goddies with other people with the same intrest.